A matrix is a table or a grid. It contains both rows and columns that hold patent queries. Each cell contains the intersection of the two queries. The example above is an example of a simple 1-tier matrix. The labels for the columns are class queries for the top CPC main groups for Google. The row labels are some of Google's major competitors. When the matrix is run, each cell contains the number of patents each of those companies owns in each of those classes. Once you click the Run Matrix button (1), the matrix will fill in the number of patents based off the intersection of the searches your labels contain. So for instance in this example, Google owns 8,004 patents in the CPC class G06Q30, while Yahoo owns 2,744 patents in the same class. 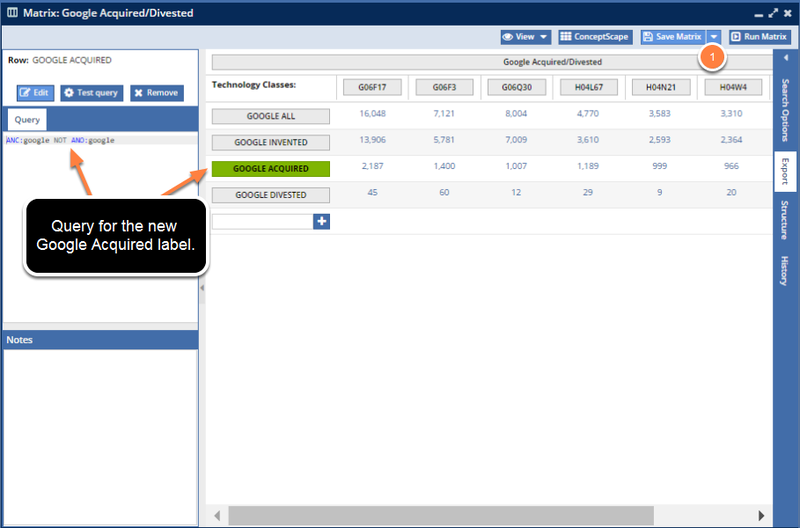 You can then click a label (here the G06F17 column label (2)) to expose, in the left panel, certain information. This information is in the Query tab (3) and the Effective Query tab (4) for the G06F17 column label. 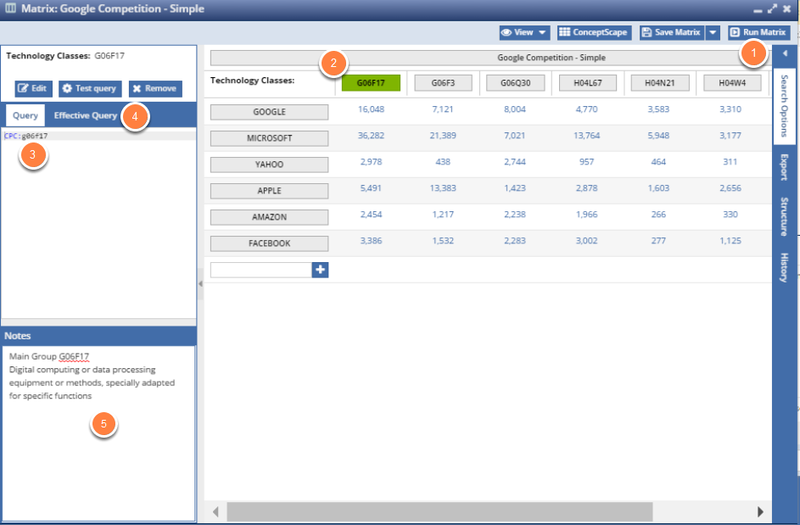 Additionally, the system will highlight the label that you clicked on. Notice that the query in the Query tab (3) is CPC:G06F17 (Cooperative Patent Classification Code G06F17). Remember that this is a simple query. The Effective Query for column and row labels is more complicated, as it includes what is in the Query tab, as well as other filters, such as date ranges, etc. Note that in this example, the query is fairly simple. It is only one advanced syntax query with one term. It does not have to be this simply, however. When it needs to be, it can be just as complicated as any query you run from other search fields. I also entered some notes in the Notes panel (5) to remember what the Main Group G06F17 actually is. This can be extremely helpful if I come back to this matrix at a later point, or if the matrix is complicated. In the above example, the Google row is highlighted. Note that the simple query ANC:GOOGLE (Assignee Current is Google) is associated with each cell in the row. The first cell (with the number 16,048) shows the intersection of the two queries CPC:G06F17 AND ANC:GOOGLE. The same process is calculated for all the cells in the grid (e.g., the cell with the number 7,121 is the intersection of the two queries CPC:G06F3 and ANC:GOOGLE). This matrix gives you a very basic high-level landscape of how Google's patent portfolio stacks up against some of their competitors. This simple matrix takes less than one second to compute. More sophisticated matrices can take longer since it may be that thousands of intersections need to be computed. The Matrix window contains all the functions you need to build much more sophisticated multi-tier patent landscape matrices. Sparklines are small charts that represent a 20-year timeline charted by the number of patents associated with each cell. In this example, the Sparklines are by Published Date, but the matrix supports options for File and Priority dates as well. Notice the 979 pop-up (1). This happens when you hover your cursor over a specific spot on the Sparklines. 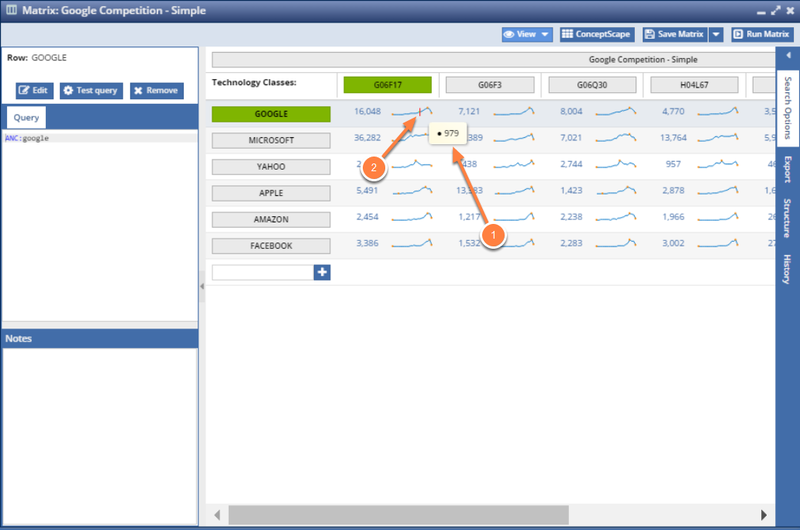 Where you are hovering on the Sparkline is represented by a small red bar (2). Click any blue number in a cell to view the patents represented there. In this example, I clicked the "2,978" in the G06F17/Yahoo (1) cell. 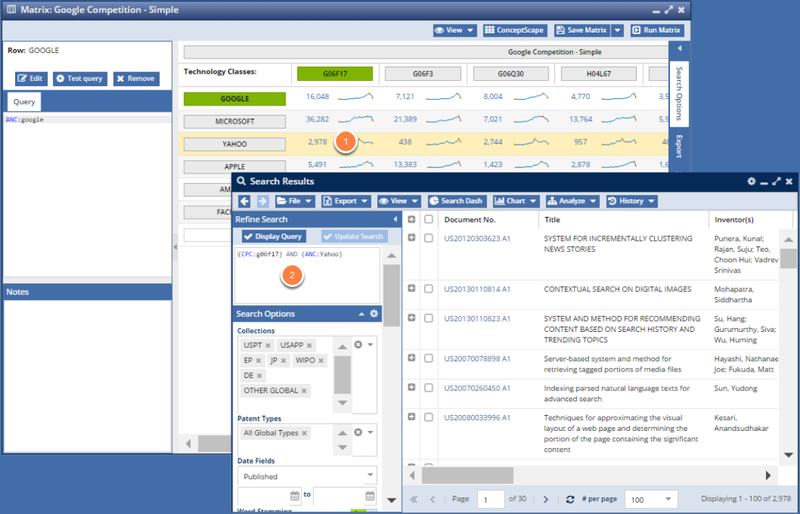 Notice that the search window (2), on the Search Results grid, shows the cross referenced query. The cross referenced query is "(CPC:g06f17) AND (ANC:Yahoo)" and includes the Search Options the query was based on. On the far right of the Matrix window, there are four horizontal tabs. Clicking the Export (1) tab gives you two export options. Result Counts --> This is the information shown in the matrix in a grid format. 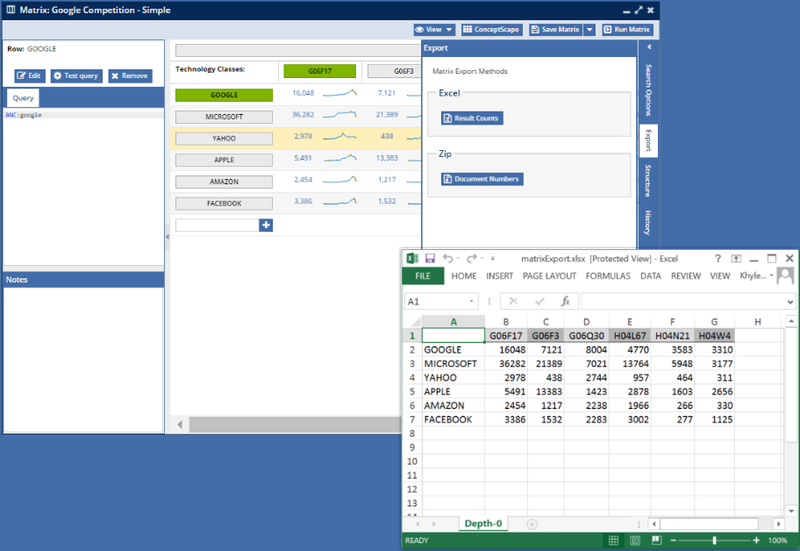 The example above shows the information in Excel (note that the excel file is overlaid on the matrix only so that we can show them together. 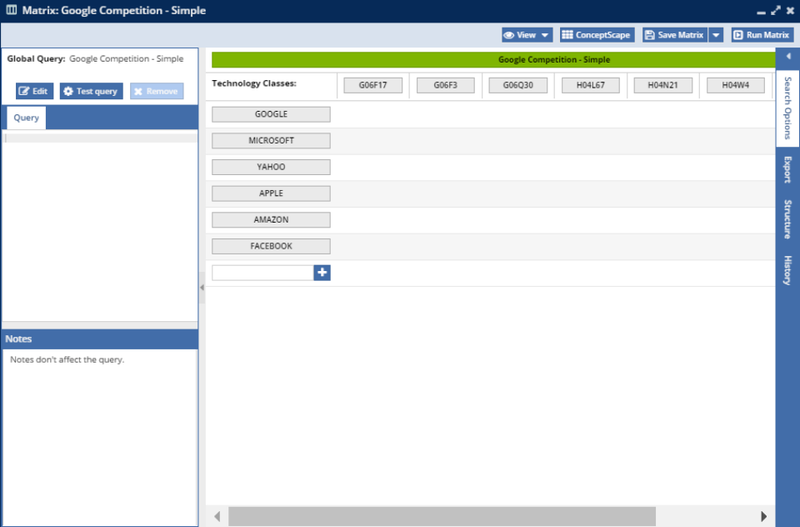 It is not actually shown in the AcclaimIP User Interface). Document Numbers --> This option give you patent numbers in a multi-file zipped folder, where each single file contains all the patent numbers in a single, associated cell. In other words, one single file here would contain the 16,048 patent numbers from cell one, another single file would contain all of the 7,121 patent numbers from cell two, etc. This simple example starts to show the power of the matrix. In the image example above, I duplicated the first matrix to preserve my technology class queries. I did this by choosing the "Save As" option from the Save Matrix button menu (1) and saved the matrix under a different name. I then deleted the assignees in the rows and added special queries to see how Google came to own these patents. In the example image above, we show a mobile phone landscape matrix of patents relating or enabling specific components of mobile phones. 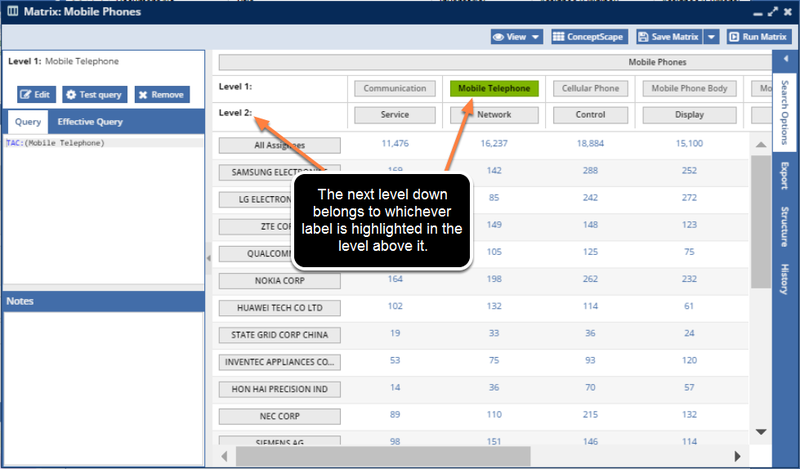 Below the Level 1 tier is a Level 2 tier which further breaks down the component into its major features and allows you to drill down further. This is because we know that patents don't read on devices, or even components of devices, but rather features of components of devices. So the matrix is a multi-tier analysis system to represent the real world. For example, you can see that Samsung has 252 patents under the Display feature, but Huawei only has 61. However, Huawei has almost the same number of patents in the Network category as Samsung does. This can give you more insight into what is important to your competitors.